52 – 58 Ann Street is a 1960’s three storey concrete framed building faced with rustic brick on site of approximately 0.08 acres. Nos. 52-54 was owned by Glenbeigh Ltd since at least October 1998. Nos.52-54 was placed on the market in March 2015 by CBRE, on behalf of Glenbeigh Ltd, with offers invited over £500,000. 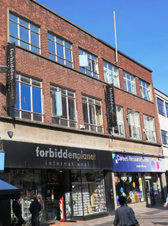 Marketing material from the agent notes that the property is let at a rent of £45,000 per annum to Forbidden Planet (Scotland) Ltd until 31st October 2016, following a lease renewal in May 2013. Nos. 52-54 sold in July 2015. 56 – 58 is occupied by the Department for Employment & Learning’s Belfast Careers Resource Centre.